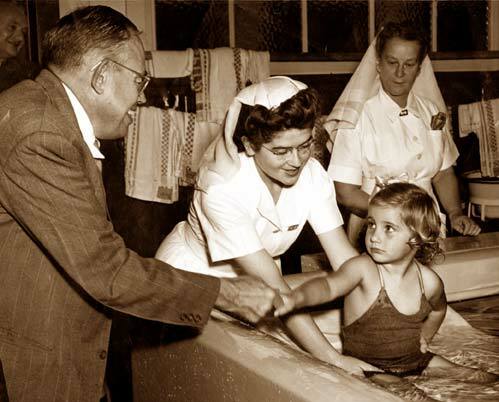 I was six months old when I got polio in an epidemic sweeping the country. My mother was 19 years old and living at home with her parents. Her two teenage sisters were at school and two young adult brothers were at work. This was a three-generation family with lots of coming and going, and polio in the house was devastating. There was a social stigma surrounding the family and for three weeks everyone was quarantined. The house was fumigated with sulphur. Neighbours were in dread of ‘catching it’ off our family, and avoided contact. Schools, swimming pools, theatres, sports events and Church services were all closed for varying lengths of time during the epidemic peak. Immediately after the diagnosis I was put in isolation for three months. This meant no more breastfeeding from my mother, no cuddles from Granny, or piggybacks from my young uncles. Isolation meant a 'nothingness', a separation which has left it’s emotional scar to this day. I was unable to move, and needed daily trips to the hospital for treatment and therapy. When I was 18 months old I was admitted to the beautiful Wilson Home for Crippled Children where I stayed until I was about five years old. I was institutionalised in paradise. Set high on the cliffs of Takapuna, the Wilson Home had sunny verandas to lay the children on, and healthy fresh sea breezes. The big windows in the massage rooms were open most of the time. Meals were taken outside in highchairs for the babies, and in beds wheeled outside for older children.